The Yamaha TZ750 is one of those legendary bikes that seem to always elicit one of two responses in people: fear and awe. The former probably stems from the two-stroke motor’s incredibly peaky power band and notoriously terrible handling in its earliest incarnations. The latter is almost certainly due to legends like Kenny Roberts taking the TZ750 to almost countless victories on both dirt and pavement. The Yamaha YZF-R1 can, in many ways, be thought of as the spiritual successor to the TZ750. Both make huge power, both are four cylinder bikes, both have incredible competition pedigrees, and both represent one of the world’s greatest motorcycle builder’s finest work. The R1, as you might expect, manages to outstrip its ancestor in nearly every measurable category but, subjectively, the looks of modern sport bikes leave something to be desired. What do you do if you’re Richard Varner, one of the principals behind MotoAmerica, and you want the best of both worlds? You call Richard Pollock, of Mule Motorcycles fame, and you come up with a plan. 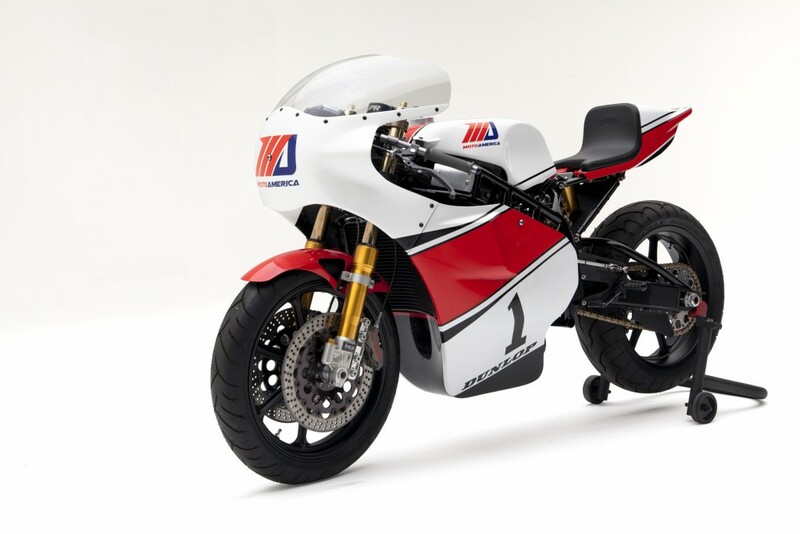 The story of this bike is also the story of MotoAmerica, the new racing series that hopes to resurrect motorcycle road racing in the United States. The story begins with Richard Varner, best known to motorcycle aficionados as the man behind Champions Moto. Varner along with Terry Karges, current Executive Director for the Petersen Automotive Museum, and Pollock were invited to meet with 3-time MotoGP 500cc Superbike champion Wayne Rainey in Monterey to discuss ways in which Wayne could get involved with motorcycles beyond his regular appearances for Yamaha. Initially the conversation was focused on creating a line of limited production Yamaha-based custom motorcycles, the inspiration for which was a Yamaha XS650 cafe bike that Pollock had built. That conversation eventually turned into ideas for a reality tv show that would feature young racers receiving tutelage from some of motorcycle racing’s greatest but when they realized that the winner of this program would have no series to go to, they started to think on a truly grand scale. This led to the idea that they could purchase the rights to the AMA National Championship and bring US road racing back to its former glory. 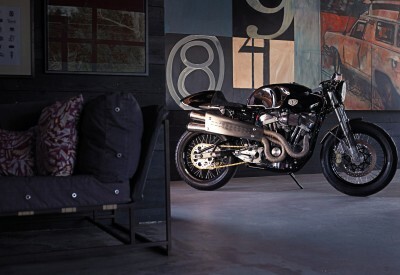 The line of motorcycles they dreamed up at that initial meeting begat one of the most exciting custom bikes in recent memory. On the flight back to Southern California from Monterey, one of the gentlemen was flipping through an issue of Classic Bike magazine when he came across a feature about the TZ750. 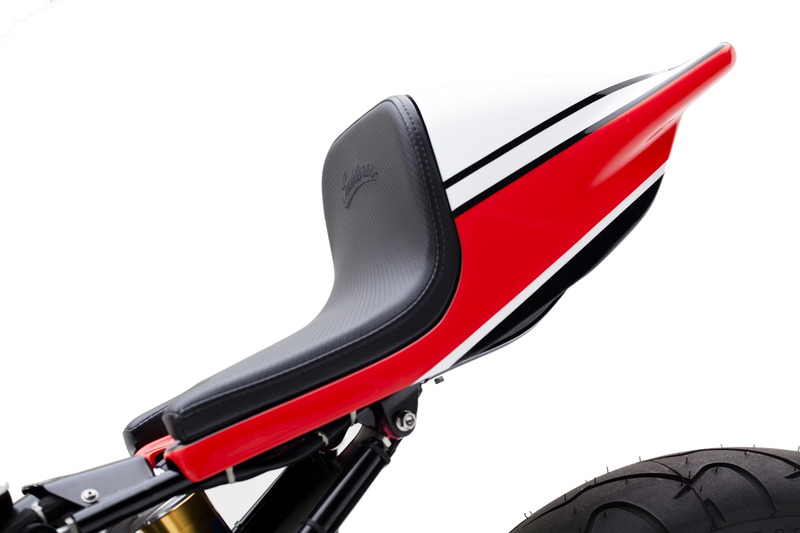 Looking at the classic lines caused something to click, lightning to strike, and the planets to align and the idea to take a modern superbike and give it the timeless styling of the TZ took shape. Once tasked with bringing this idea to life, Richard Pollock contacted Italian illustrator Oberdan Bezzi to do the conceptual drawings before committing them to metal. Once Oberdan had worked his magic, Pollock sourced a donor R1 and spare motor, both 2004 racing models, and then began the long 2 1/2 year build. 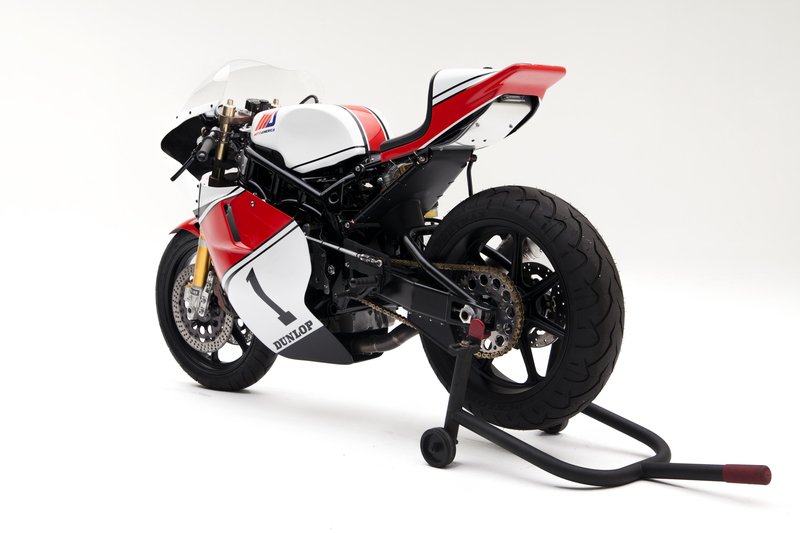 Once getting the ex-race bike back to his shop, Richard began disassembly and built a fixture in which to mount the frame that allowed him to retain the bike’s basic geometry. 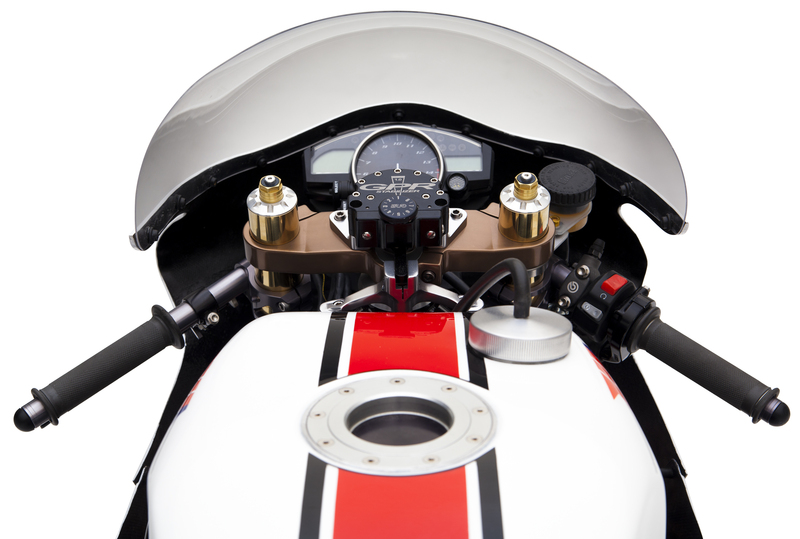 He made significant adjustments to the frame to change the look of the bike to more closely mirror the TZ750. Getting the frame laid out, tubing bent, and assembled took the better part of eight months but the end result is clearly worth it. 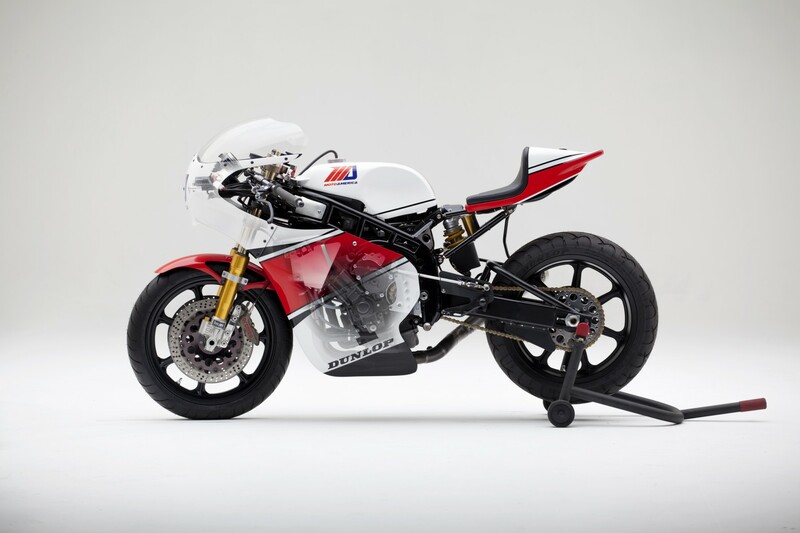 The stock R1 frame is definitely best left covered by fairing, but Richard Pollock has taken it, completely reworked it and elevated it to something close to art. 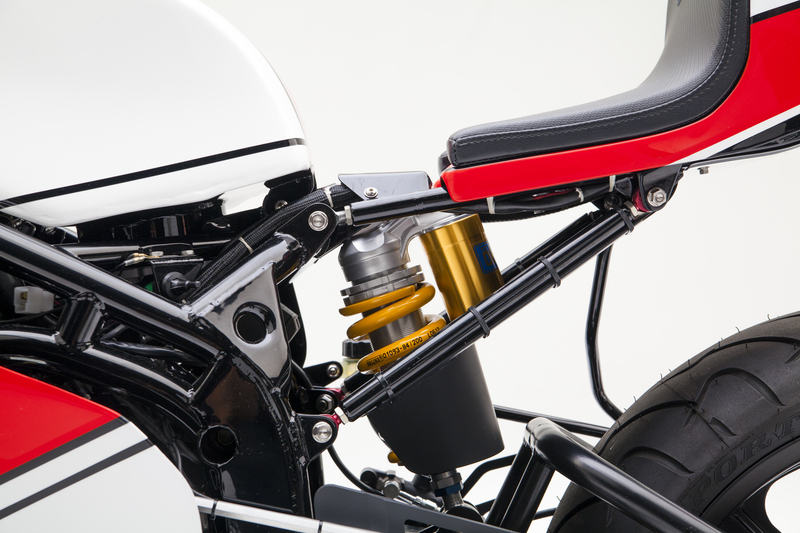 The bike also features a custom extended swingarm with tubular bracing which Pollock had built by Trac Dynamics, and the rear subframe is entirely heim jointed and adjustable. 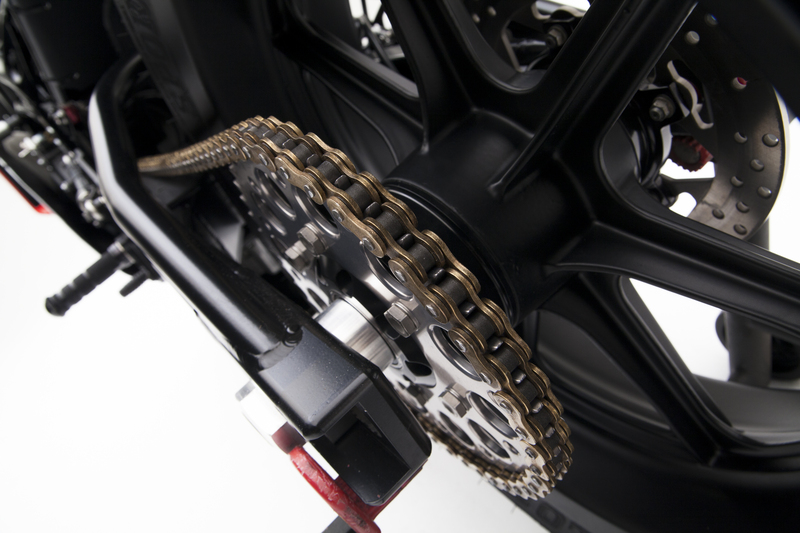 The rear shock is a handmade and custom valved Öhlins, and eschews conventional linkage. 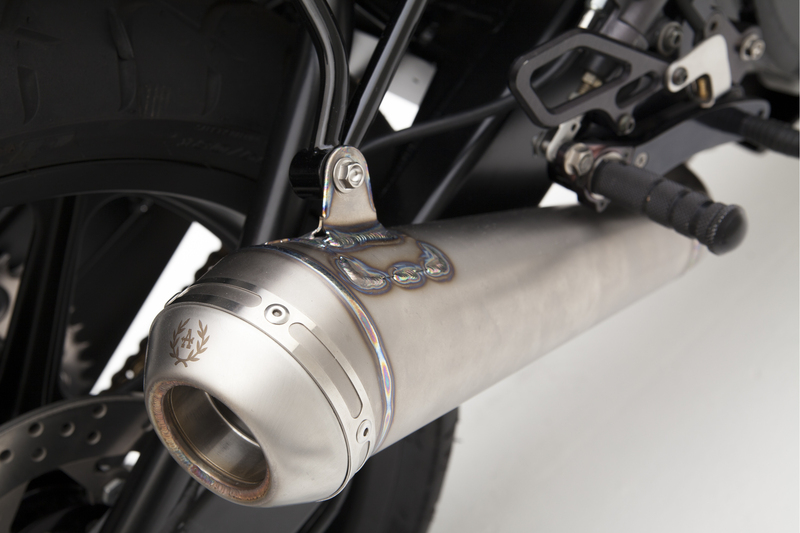 The front forks are also from Öhlins, though they are off-the-shelf units and are secured by Pollock’s custom adjustable offset triple clamps. Once the frame was done, the next real challenge for Pollock was to build an airbox that would function as it should while looking right. Richard jokes that, “I should have built the airbox and then built the frame around it!” and considering the space he had to work within, he’s probably right. Eventually after much trial and error and stops and starts, he made the airbox work. The biggest challenge by far was, according to Pollock, wiring. On a normal modern superbike, there would be plenty of fairing to hide all the wiring that the bike needs in order to run. 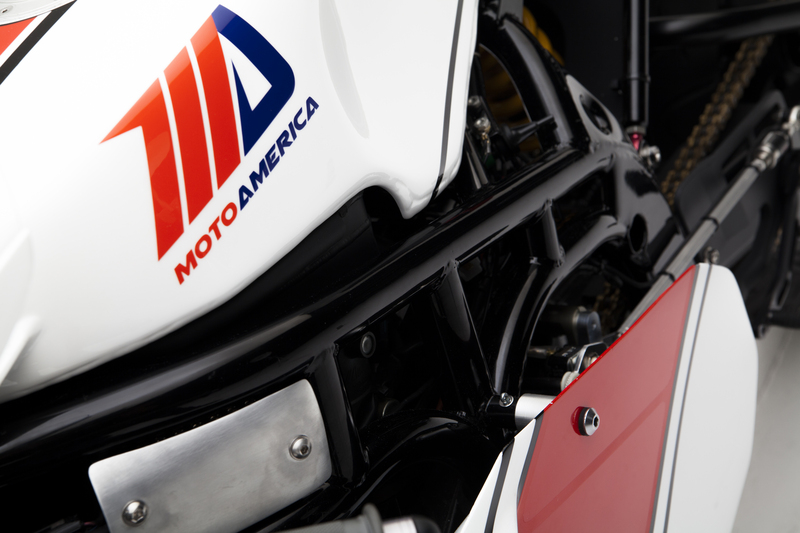 On the MotoAmerica R1 though, the TZ750 body work leaves much of the bikes guts exposed. Wiring the bike took nearly 10 months to complete, though there were stops and starts in that time. 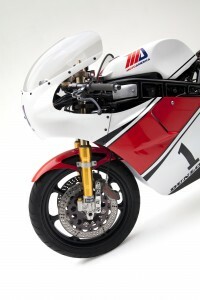 Pollock was able to put the ECU under the bike’s fairing in a custom bracket. There is a Dynojet Power Commander in the tail section along with a carbon fiber-bodied lithium ion battery from Lithionics. 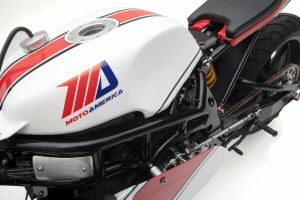 The gorgeous bodywork that caused all that wiring headache is the genuine article, real TZ750 stuff. Each piece has been carefully reshaped and reworked to fit the larger R1. 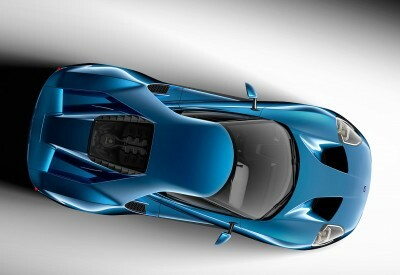 Despite the change in dimensions, it manages to look sleek and graceful, as if it was meant to go there all along. A shape that perfect needs perfect wheels to really make it sing though, and Richard found the ideal set in the form of a pair of 18” Harley-Davidson XLCR rear wheels. These were then widened, and modified to accept stock R1 bearings. Pollock made his own adapters for brakes and sprockets. 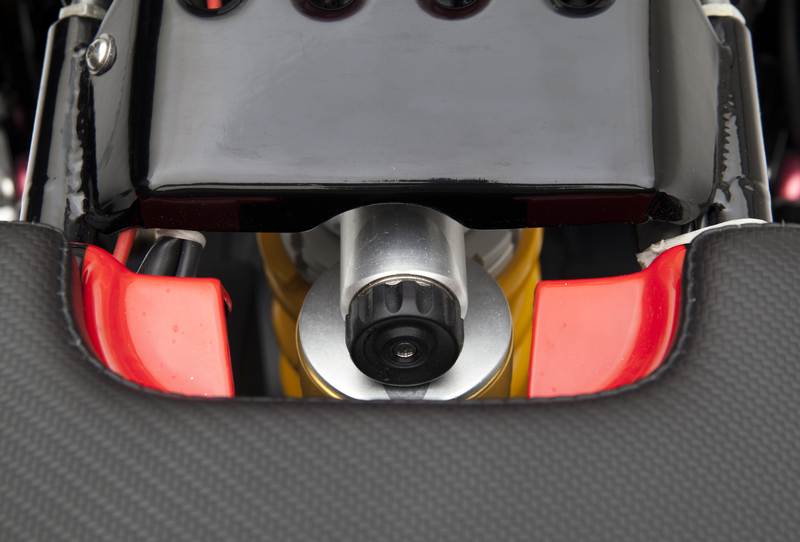 Ample braking force is provided by Brembo in the form of their red line calipers and a radial master cylinder. When it came to rotors, however, Pollock took the road less traveled. He was put in contact with a company called Ultra Lite Brakes who typically supply their unique ceramic coated titanium rotors to racing series like NASCAR. This shaved an incredible amount of weight from the bike, with the titanium units coming in at a mere 70% of the weight of steel rotors. Pollock assures us that the brakes on the bike are fantastic and get better with continued use. Bikes like this don’t come around often. They’re often too exotic, too expensive, or too complicated for most builders. Few people have the vision of Pollock and the gentlemen from MotoAmerica. That the bike got built at all is something to celebrate, but having it turn out as beautifully as it did, with such amazing performance is almost unheard of. If this bike is indicative of what happens when MotoAmerica puts their minds to something, then the future of road racing in America starts to seem quite a bit brighter than it has in recent years and we’re thrilled to be around to witness it!